We combine exquisite bouquets of Ecuadorian roses with the incomparable emotion of a personal message. To warm the heart of that special someone, we can customize your roses or petals with a personalized message, picture, logo, or monogram. Imagine wedding or anniversary flowers imprinted with your names, your special date, or a touching photo of the two of you together to make your wedding/anniversary day timeless and unforgettable. Preserve the memories of your loved one’s life in a way you’ve never imagined while giving a treasured memento of the day to keep forever. 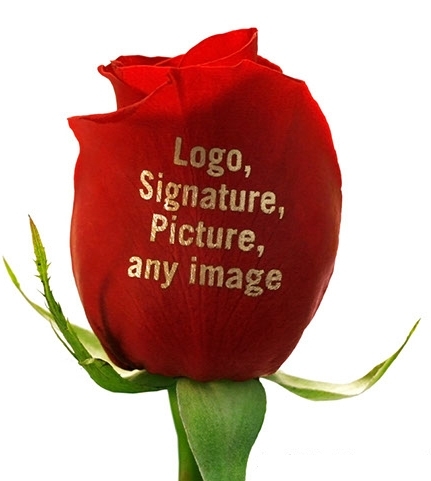 Celebrate any holiday, birthday, birth of a child, prom, or special event with a unique custom saying on the petal of a fresh-cut rose. The possibilities are limitless. Complement your business by providing a unique customer ‘Thank You’ gift to strengthen loyalty. Personalized roses will be the perfect addition to every aspect of corporate life to help get your company name and logo recognized. If you have a specific need that is not featured on our website, please contact us directly. We can customize any bouquet for you with other flowers or special phrases. The sky's the limit!